Meet our eco adventure guides, who will guide you to amazing coral reefs for snorkeling and share their knowledge of Turneffe Atoll. Our top Atoll Adventure guide, Abelino "Abel" Coe, was born and raised in a Mayan community in Southern Belize and his first language was Maya. Abel is an avid student of Mayan history. He is also very well-versed Belize's history. Days with Abel are informative and fun. He knows the flora and fauna of Turneffe intimately and is very adept and finding all of the interesting things. Abel is an excellent snorkeler and makes his guests feel comfortable visiting the underwater wonders at Turneffe. He, and our other guides, are masters at helping everyone feel comfortable in the water and beginners can learn to snorkel on our sandy shore before visiting the reef. With at least 60 species of birds at Turneffe, birding is another highlight. You may also want to tour the atoll looking for manatees and dolphins or enjoy an afternoon kayaking. 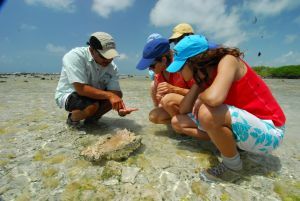 Our Atoll Adventure Program is a very flexible and is tailored to fit the particular interests of each group.